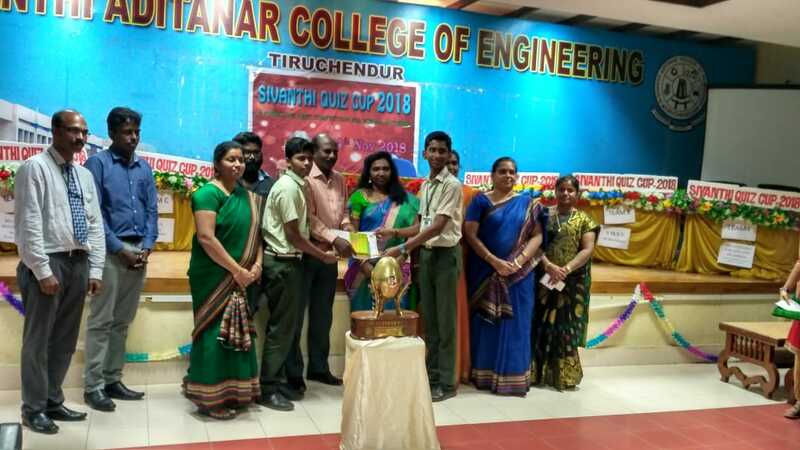 Sivanti College of Engineering, Tiruchendur every year conducts a State Level General Quiz on Children’s day for the students of classes 10 to 12. This year also on November 14, 2018, they conducted the Sivanti Quiz. Schools from different districts of Tamilnadu took part in the Preliminary written round. From the Preliminary round 18 teams were selected to participate in the Semi Finals. The 18 teams were divided in to three pools consisting of 6 teams in each pool. The first two place winners from each pool were selected for the Finals which was played on the Stage. Our students V.Sri Siva Murugan and B.Selvamuthu Balaji of class 12 and 11 answered very well and maintained the lead right from the first round. Finally they won the first place with the difference of 60 points and grabbed the Sivanti Quiz Cup for the Ninth Consecutive year.